Stock up with college football party supplies so the next time your team is on the field, you will not be rushing to the store during the pre-game analysis. The best source for these supplies is the college bookstore. Both on-campus and off-campus bookstores offer plenty of fun party decorations perfectly suited for cheering on the home team. Gaining access to these bookstore supplies can be difficult for people who have moved far from their college campus. In these cases, check the bookstore's online shop. Adults and kids who pick up college football party supplies may want to throw a few autumn party decorations into the basket, too. The seasonal fan favorite game is in its glory during the time when leaves are falling from the trees. A few garlands or centerpieces can dress up an otherwise athletic decorating scheme. Of course, no one will know what time to arrive at the football-themed bash unless invitations were sent to everyone in full pigskin style. Create custom invitations using college stationary and a home printer. Alternatively, use a black felt marker and write all of the pertinent information on a pennant-shaped flyer. If the game is part of a college party theme for youths still enrolled, consider just sending out some online invitations to everyone from class and the dorm. Buying ice in bulk ensures that the freezer icemaker will not get behind. Storing extra pop and alcoholic drinks in the garage keeps them chilled and ready to drink. If snack food goes uneaten, keep the bags closed until the next big party. A college football party can be extra special by adding a few creative touches to the supply list. One thing is to look into borrowing a large chalkboard from a local school district or even buying one if it can be used in a kid's room later on. Create a big scoreboard for everyone to use at home. Kids will love being scorekeepers and it will be a great talking point for guests. A large party for a college game can turn into a massive bash, especially during play-offs. Children may not be as interested in tuning into the big game as their parents, so consider calling a party supply rental store to find out if you can rent a bounce house or large blow-up sports field to keep children occupied. Go easy on yourself when it comes to party favors. The perfect solution for both young and old is to purchase temporary tattoos featuring footballs or the team mascot. Finally, remember to make cleanup easy. Buy cheap plastic sheeting and cover any carpeting in main rooms. This is essential if the party has the potential to become a wild college party or if the invited fans are known for getting overly excited during tense game moments. 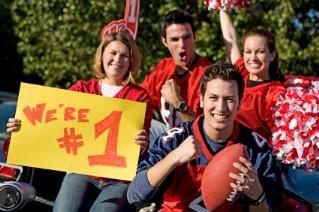 Even if the college team loses the big football game, guests will remember all the fun they had at the party. Keeping all of the necessary supplies on hand will mean you catch the 50-yard return instead of being stuck in the car, driving to get more ice.